To play soothing notes of peace and wisdom from the instrument named ‘Life’, it is essential to tune it. In the spiritual parlance, 'Satsangs (Spiritual discourses)' play the role of a tuner, which fine-tune us on to the path of spirituality. They offer the means to bring reformation in life. Through satsangs one gets to know the real aim of life. One learns about the importance of human birth. Yet another session of Monthly Spiritual Congregation unfolded by Divya Jyoti Jagrati Sansthan (DJJS) on Sunday, 11th June, 2017, at Nurmahal Ashram, Punjab. The series of melodious devotional bhajans engrossed everyone in the divine ambience of spirituality and helped to fully concentrate on noble thoughts rendered in the discourses of the day. The articulations by the Preacher disciples enlightened the devotees and boosted their morale. In life there are a number of people who truly deserve our gratitude. Some have rendered their helping hands and provided wise counsel in moulding our present. In this journey of happy and sad moments of life, a human is often finds the solace in the company of his closed ones whose psychological support becomes indispensable to stay composed and focused even when the circumstances turn unfavourable. One of the greatest relations in this world is that of Guru and Disciple for the friendship they share is incomparable and greatest of all. The Guru-Disciple tradition is a unique feature of our culture. The Guru is the one who addresses to our ignorance. Guru is the one who removes the ignorance of disorder from our life and teaches us how to live a blissful life. The Spiritual Guru reveals our true identity to us. Owing to ignorance, we are under the false impression that we are just a material body; but in reality, we are not the body, but the soul. This kind of a friend is unlimited in his approach, for his roots don't lie in this materialistic world, but belong to the world of eternity. His power is unlimited and his existence is beyond time. It is only his guidance and mentorship that help one strike a right chord between different activities. Guru, the eternal friend, doesn't let your morale go down, but boosts it, does not contradict your opinion, but sets its compatibility, doesn't allow pessimism to disrupt you, but infuses your instinct with never-ending zeal. To make His disciples excel, He bestows all His support, whenever and wherever needed. The Guru is like a touchstone that can transform iron into gold. Even if you are incapable and incompetent, he will take you to the peaks of success and triumphs for sure. The Guru is the one who nurtures his disciples with fathomless love and competent knowledge and ensures them his divine protection against the evils lurking in the society. The divine knowledge that our revered master Shri Ashutosh Maharaj Ji (Head and Founder, DJJS) has bestowed upon us is the greatest gift that we can ever ask for. With such a powerful tool being put in application, hopes have certainly revived to see a world prefixed with adjectives like, happy, blissful, and peaceful, where there is no place for ailments, turmoil, and sadness. 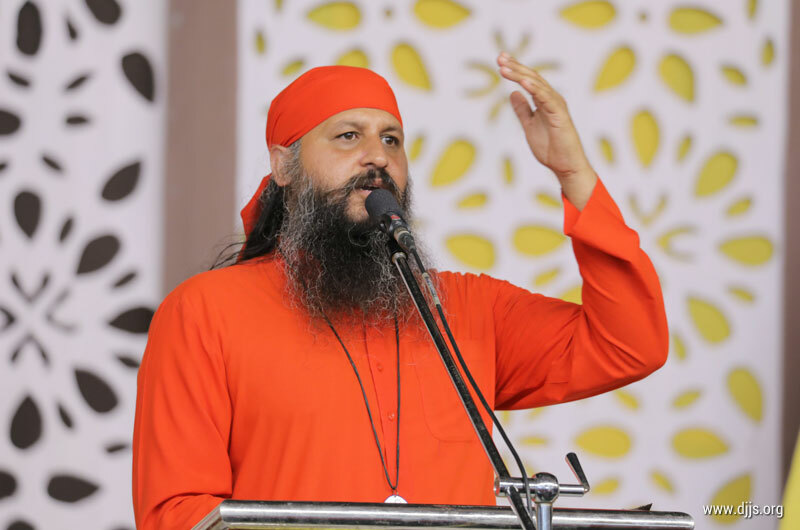 Shri Ashutosh Maharaj Ji incorporates aspects of scriptures, that are capsules of science and most relevant for modern-day life, into his teachings and practices. His scientific methods for self-transformation have universal appeal. His insights into the mechanisms of life are an outcome of his profound experience of the Self, and serve as a guide to exploring the deeper dimensions of life. His life and work serve as reminders that the inner science of yoga is not esoteric philosophy from an outdated past, but is absolutely relevant and applicable to our lives today. It is the need of an hour that the ones who have realised their True Self by the grace of our Perfect Master, Shri Ashutosh Maharaj Ji, need to come together to trigger a bigger change in the society. The goals and visions are not confined to limited boundaries; the mission of the Spiritual Master is supremely vast! His aim encapsulates the accomplishment of the toughest task in the world, i.e. to bring reformation in every individual in terms of his thoughts and actions.